Sun in Libra will be in charge of this couple’s social life, while Moon in Virgo will keep things running smoothly at home. Both of these signs want to make others happy, so they’ll have no problem looking after each other. The one thing they’ll have to watch out for is succumbing to anxieties about not keeping each other perfectly happy. 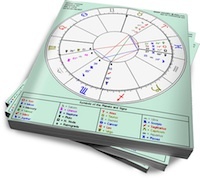 Sun in Libra’s goal is to create harmonious social contacts. Whether he’s enjoying himself at a party or planning a romantic evening with his partner, he’s all about the serene interplay of light, happy energy. If Sun in Libra had his way, the messy underbelly of human relations would never have to be dealt with. As his partner will discover, he loathes confrontation, and would rather focus on how his lover is feeling (as long as it’s not too unpleasant) than what he actually wants — especially if what he wants conflicts with his lover. If he is fully self-aware, he’ll be able to set boundaries and express displeasure with steely politeness. If he’s not self-aware, Shadow Libra will sneak out with passive-aggressive jabs. Moon in Virgo needs to be of service. She feels most secure when keeping someone else’s life running smoothly. If her lover can deal with her fussing, worrying and constant little improvements, he’ll find that Moon in Virgo is one of the most considerate partners around. However, her Shadow side will manifest if her worrying spirals into OCD-level obsessions. Her fixation on perfection can become acute when she is under stress.